I just ordered my second Woodworker II. I bought my first Woodworker II at a tool show in 1992 and only had to have it sharpened 3 times! Once you try a Forrest blade you will never use any other brand of blade...I've used them all. 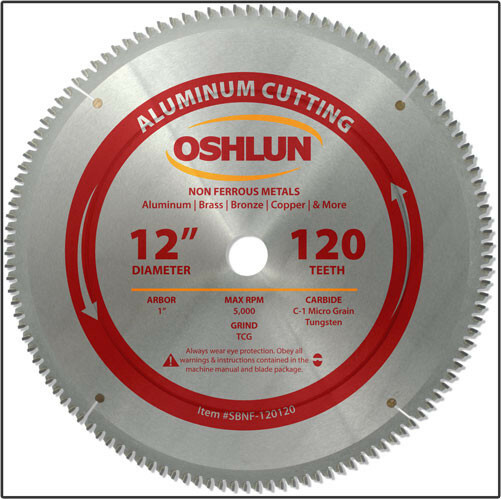 Oshlun nonferrous blades have been designed with a negative hook angle, triple chip tooth grind, and precision ground micro grain carbide tips. The specially formulated tungsten carbide lasts longer than other carbide grades and leaves burr free cuts in all types of nonferrous metals, such as: aluminum, copper, brass, bronze, and even most plastics. The 10” and larger feature copper plugged expansion slots for reduced noise and vibration while several of the smaller diameter blades feature laser cut expansion slots and heat vents for cooler operation. WARNING: Never attempt to cut steel or ferrous metals with these blades. It is highly recommended that you use a liquid lubricant or coolant like WD-40 when cutting nonferrous metals. Proper clamping devices should be employed.